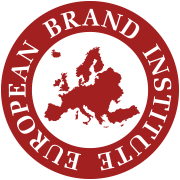 The global brand value ranking GLOBAL TOP 100 BRAND CORPORATIONS by the European Brand Institute– the European independent experts for brand, patent & IP valuation & strategy, examining more than 3.000 brand corporations and their brands in 16 industries, with comparisons of Europe, America and Asia. Apple remains world’s most valuable brand corporation with a brand value of EUR 136,903 bn (+21%), followed by Google representing a value of EUR 73,632 bn (+9%) and Microsoft with a brand value of 66,598 bn (+7%) which overtook the Coca Cola Company. LVMH remains Europe`s most valuable brand corporation representing a brand value of EUR 39,829 bn (global rank 14), followed by AB Inbev with a value of EUR 35,781 bn (+20%) and Nestlé representing a value of EUR 34,289 bn (+4%). TOP 10 China grow by 29%, with China Mobile remaining No.1 Asian brand corporation with a brand value of EUR 48,679 bn (global rank 6) and Baidu showing the highest brand value increase of +47% (EUR 12,413 bn). Asia, especially China is growing their presence in the TOP 100. Europe is decreasing. Average growth of TOP 100 is 11%, TOP 10 Asia 15%, TOP 10 USA 13%, TOP 10 Europe 6%. US brand landscape is dominated by IT & Technology, Consumer Goods and Financial Services and represents 47 (+1) out of the TOP 100 brand corporations. Europe represents 35 (-6) with Germans leading, whilst Asia is represented with 18 (+5) brand corporations, thereof 10 from China. Wien - Am 8. 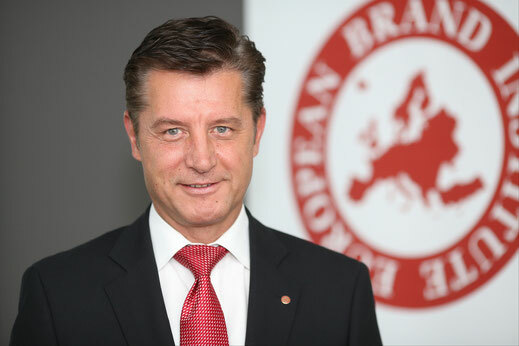 Juli 2015 präsentieren Dr. Gerhard Hrebicek, Vorstand European Brand Institute, Dr. Kristin Hanusch-Linser, Vizepräsidentin IAA Austrian Chapter und Roswitha Hasslinger, Co-Herausgeberin best2trust-Studie die Ergebnisse der zwölften Österreichischen Markenwert Studie – eurobrand Austria 2015: 1. Red Bull mit EUR 14,82 Mrd. führend, Swarovski behauptet mit EUR 3,26 Mrd. 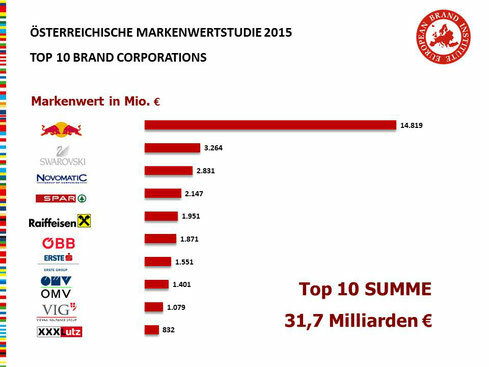 Platz 2, absolut und relativer Wachstumssieger Novomatic Group of Companies mit EUR 2,83 Mrd. Markenwert TOP3, Erste Bank und ÖBB verzeichnen starkes Wachstum, VIG und XXXLutz rücken in TOP 10 vor.